Welcome to Joy Orthodontics, where we believe in putting you and your smile at the forefront of all we do. When you’re in our care, you will be treated gently and compassionately, as we would care for a member of our own family. Dr. Mitchell Levine and Dr. Jessica Crews, as well as our team members, are as passionate about developing friendships with our patients as we are about creating healthy, beautiful smiles. We’d like to build a friendship with you while developing your new smile, too. 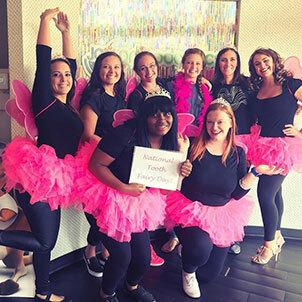 Everyone on our team understands that your goals in seeking orthodontic care, in addition to your clinical needs, are different from anyone else’s. Instead of a cookie-cutter approach to treatment, we’ll spend time talking with you about your goals in considering orthodontia and reviewing the results of your complimentary exam. Then we’ll create a treatment plan and present it to you, and explain the different steps and options available to develop your new smile. We’ll encourage you to be part of the decision-making process; this is your smile, after all! Our practice is equipped with the latest, proven technologies used for diagnostics and treatment processes, which lead to shorter treatment times and strong results for our patients. All the technology in the world cannot replicate the one-on-one care delivered by our doctors and team members, though, because they understand how to combine technology and hands-on experience to create healthy smiles. Every practice has certain things that set them apart from others. At Joy Orthodontics, Dr. Levine is one of the few board-certified orthodontists in the region, which means he has undergone rigorous testing and examination by the American Board of Orthodontics. Becoming board-certified is a lengthy process and signifies that Dr. Levine is committed to the pursuit of excellence and proficiency in the field. We are pleased to offer complimentary consultations at both of our orthodontic offices, located in Jacksonville and St. Johns, FL, where we welcome patients from St. Augustine and all nearby communities. For more information about the care offered at Joy Orthodontics and to schedule your consultation, please contact us today!